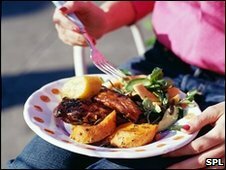 A talking, computerised weighing device that tracks how quickly food is gobbled off the plate could be a solution to childhood obesity, researchers say. The Mandometer keeps tabs during meal times and tells the user if they are wolfing down meals too fast - a habit experts have linked to weight gain. In a trial with 106 obese children the gadget showed promising results, the British Medical Journal reports online. After 12 months of use the children weighed less and ate smaller portions. Their speed of eating was reduced by 11% compared with a gain of 4% in a comparison group. Experts believe eating too fast can interfere with an inbuilt signalling system that tells the brain to stop eating when the stomach becomes full. But early in life, with instructions like "make sure you eat it all up", children are taught to override these signals. Scientists at the Karolinska Institute in Stockholm set out to design a device to pace eating, primarily to help patients with the eating disorder bulimia, who tend to eat quickly. The Mandometer plots a graph showing the rate at which food disappears from the plate, compared with an "ideal" graph programmed in by a food therapist. And if the user is eating too quickly, the talking machine will tell them. Inspired by this work, researchers at Bristol Royal Hospital for Children and the University of Bristol, decided to try out the device on their young, obese patients. Lead researcher Professor Julian Hamilton-Shield said: "It really did seem to help them." He said the children learned how to eat more slowly and, as a result, felt full sooner and ate less. "Their portion sizes decreased by a seventh. Even though this may not sound a lot, it is enough to make a difference. "And the improvement seems to be durable because it continued six months after the trial finished." He said people should aim to take at least 10 minutes to eat meals, ideally sitting at a table rather than in front of the TV. "What tends to happen when we eat alone or while watching the TV is we eat more quickly. Then we miss the signals that tell us we are full up and to stop eating." Tam Fry of the National Obesity Forum said a Mandometer was useful but should be superfluous. "Parents should be able to teach their children to do this themselves. The tragedy is they do not. "We have far too many children eating far too much and piling on the pounds, causing future problems not only for themselves but also for the NHS."